All Things Crafty: What was I thinking??? 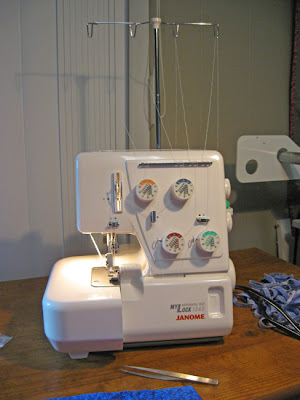 Long ago and far away, I'm ashamed to say "years" ago, I purchased a serger from the QVC outlet along with my Janome Memory Craft sewing/embroidery machine which I'm still using. I was so enamored with the sewing machined that I had purchased that I set the serger box aside. It kept getting moved and ended up in storage. Probably 5 feet of boxes piled up over time on the serger box in storage. I kept saying, I need to get that out and set it up. Overtime, it got further and further from reach in storage. Finally, today was the day... I was determined to get to the Janome Box. I unpacked the serger and set it up. Watched the mini video and fed it a piece of fabric. At first it was not a very strong, tight stitch/weave and I was not overly impressed. Turned out, when it was threaded it was not placed through the proper feeder at the top. I got it fixed and wow, what a difference. What was I thinking not digging deep to pull this out earlier. I plead temporary insanity because I love my new (old) toy!!. 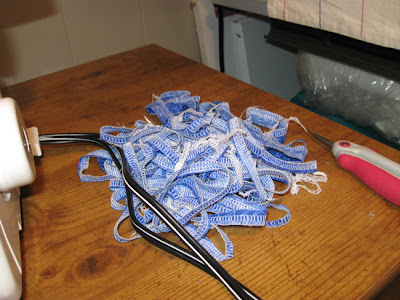 Look how many strips I did. I could not stop. Now, no more french seams on the pillowcases. Nothing but serging for me on them now!! I'm so glad you found time to play! I don't use mine often anymore, but there are some jobs that are just better serged! ;-) Have a great weekend! I'm making Shannon's BOM too and using black background with Fairy Frost stars. With a dark background I think all colors pop so it doesn't matter if they're the proper color or not. Still pretty!